Why work so hard to forage, when we have farms? Harvesting is the only way to get the freshest produce. Unless you live on a farm, the only way to make the field to table short is to forage. To get to market, farmers have to harvest produce hours in advance, then load their vehicles, travel from farm to market site and then unpack the vegetables people come to buy. In the field, harvest a few leaves, blossoms or fruit leaf, flower, or fruit. Taste one immediately. Save the other and taste it later. How were the flavor and texture different? Did you also notice that the more you handle any fruit or vegetable, the more it gets bruised? That also impacts flavor. Let's face it, whatever we pick and nibble in the field will taste better than anything brought home later. Where else can you do your shopping while on a daily walk? Quickweed growing in a flower pot. In some urban and suburban neighborhoods residents plant flowers and vegetables. I've actually seen corn plants and tomato plants around some trees in sunny urban neighborhoods. People care about their homes and most of the time these bits of garden are well tended. You can be sure that weeds will grow and if you are in a position to make friends, offer to help weed. First, trim the tender tops and then root out the weed. 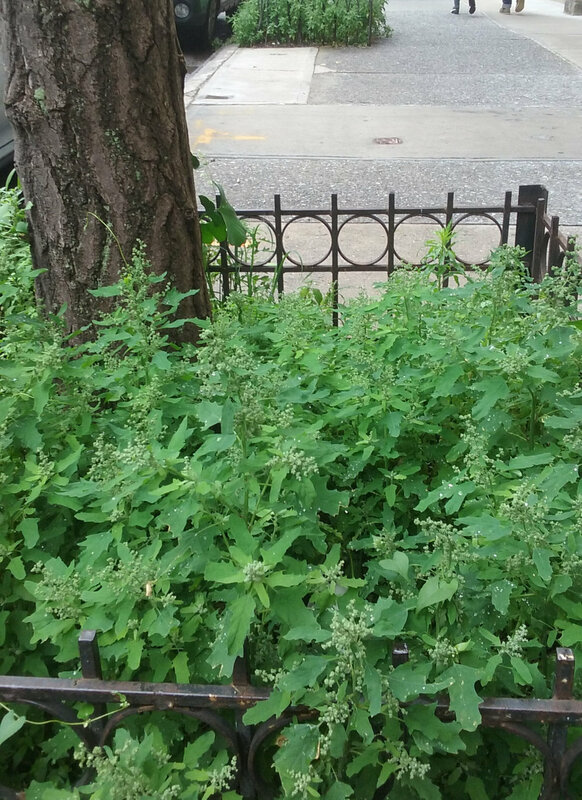 If it is not an invasive bully, why not replant that weed in your own window box if you have one? As you become better acquainted, these neighbors may be willing to let the lamb's quarters, purslane, and Asiatic day flower grow, knowing you won't let them crowd out their plants. Now, you'll have a regular foraging place supported by your gardener neighbors. I'm a forager in everything I do. I forage for farmed produce and household items left behind by former neighbors in addition to foraging wild foods. It's not just about saving money, it's also about keeping useful items out of the land fill. In my perfect world, we'd all be foragers looking at our streets, roads and open spaces as places to nurture, rather than places to throw our garbage. Is it a dream? Maybe. But in an often fast-paced, wasteful and stressful world, it's a pretty good dream. Acorns are probably my favorite foraged food now that I know how to make them tasty. They are nutritious and filling. As an urban/suburban forager, I have a freezer instead of a wood stove, which works best for storing the white oak acorn species I typically gather. When I am ready for acorn burgers, I take out the amount of acorns I need for each recipe. Every once in a while, I have a few days to spend in the kitchen. I will prepare more acorns than I needs and put the prepared acorn in freezer bags to use as needed. Acorns stored in their shell in the freezer have lasted three years or more in my deep freeze. If I make a large amount of chopped acorns to freeze for later use, I try to use that within a year. Acorns are the original slow food. Acorns in the white oak family will release their tannins more quickly than red oak acorns. In an ideal world, I'd live near a fast moving stream and let Nature do the work. But even in the 21st Century, acorn preparation can be timed to your daily schedule. Once you defrost and remove the shells from the acorns, chop them in your food processor, or if you're stubborn like me, chop them by hand. I fill a five gallon pot with water and bring it to a boil. Remove the pot from the heat and add acorns that have been shelled and chopped. This is the slow food part. Let the acorns soak for six or more hours. Go to work or whatever you have to do. When you come home, drain the water. I save a bit of the water to use on my skin to soothe insect bites or sunburn. Discard the rest. Fill the five gallon pot with fresh water, bring it to a boil. Remove from the heat. This part is critical. If you boil the acorns in the water, they will be mushy. Let the acorns soak. Do this again before your go to bed. In the morning, taste one or two acorn pieces. If your mouth goes dry, start with a clean pot of water and repeat the process. The acorns will taste mild, maybe even sweet when the tannins are completely removed. Once the acorns are ready, you can put them back in the food processor for a finer texture.